If you have a lot of content on your site it is critical for it to be well organised so your visitors can find what they are looking for quickly and easily. 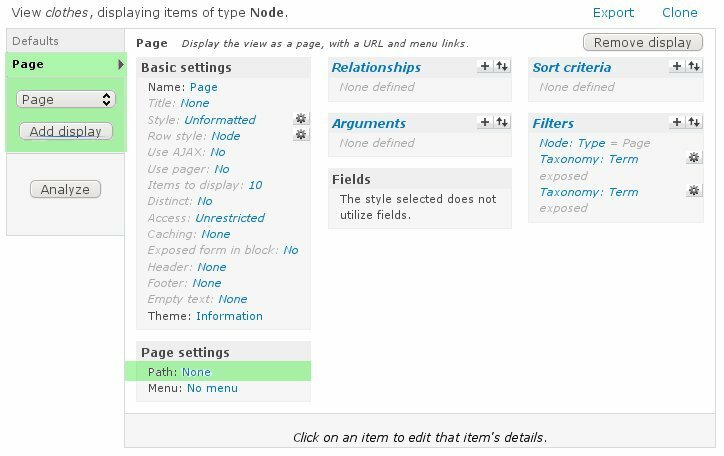 Drupal has a powerful system called taxonomy to help you organise your content. Taxonomy is another name for categories and you can have more than one type of category (vocabularies) that apply to your content. For example a clothing product could be categorised under size and also male or female. It is easy for you to set up these categories and then apply them to your content. Now when you create a new page of the content type you selected you will be able to categorise them. Later in this tutorial I will be showing you how to filter content and choose what you display to your users. Now would be a good time to be able to handle images. Let's create a few pages selecting different terms and inserting an image. When you save a page you will see the terms listed as links at the bottom. If you click on one of these it will show you all content that has the same category. This in itself isn't that useful so we'll now see how you can allow your users to filter your content using multiple categories. To filter your content we will be using the module. It's a very powerful module with many options. I will be introducing you to a small portion of it. If you haven't already, download ‎Views‎ and enable Views and Views UI. Views in its most basic form allows you to create a list of content depending on certain terms. We are going to allow your users to filter your content themselves so they can find what they are after. First of all we are going to create a view and limit the content to a specific type. Fill out 'View name' e.g. clothes or whatevever you want to call your list and click 'Next'. Now you will see quite a complex page. The bit we're interested is on the right: 'Filters'. At this point you may get an error. This is because it is set up to display fields but we haven't selected any. To avoid this error lets set the view to display nodes. At the bottom you should see several 'page' nodes that you created earlier. Now we are going to do the work to allow users to filter themselves. Repeat for the other vocabulary and then save the view. Enter a path such as 'clothes' and save the view. Now at the top right of the view there is a 'View "Page"' link that will take you to your new page. This page simply shows several full nodes. 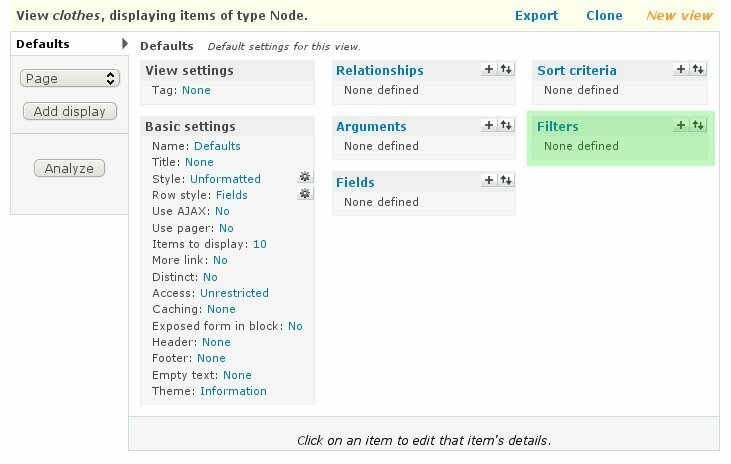 Earlier we changed the row style to node. Usually we want to display a limited amount of inf ormation and we can do this using fields. 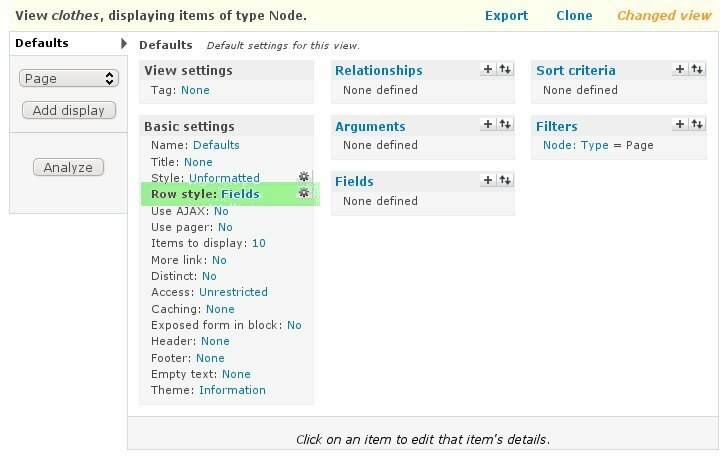 Change 'Row style: Node' to Fields and click 'Update default display' and then 'Update default display' again. Use AJAX: AJAX is a dynamic technique used to refresh part of a page. This means that if you sort a table or change page, only the view will be refreshed, not the entire page. Use pager: When you have many items you don't want to have them all displayed at once. This will allow your users to page through results. 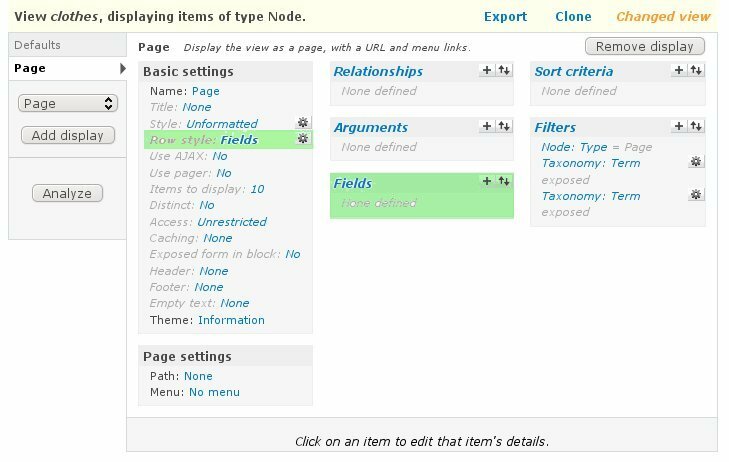 Items to display: Change the number of items displayed on each page. Distinct: Certain view options will cause a node to appear more than once. This will help to stop that. Access: You can use this to limit access to the view to certain people. Caching: Generating views requires processing. You can minimise this processing by changing caching options. Header: Allows you to insert your own content above the view list. Footer: Allows you to insert your own content below the view list. Empty text: If the view options results in no items you can choose what text to display here.